Review: "Centipede: Septober Energy (Reissue)" - Sea of Tranquility - The Web Destination for Progressive Music! Talk about an assualt on your senses! 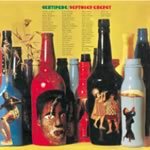 This 1971 recording from Centipede, a huge jazz-rock/prog orchestra , produced by King Crimson's Robert Fripp and featuring compositions composed by Keith and Julia Tippett, is a noisy, avant-garde, four piece section of extended music. There's nothing that resembles commerciality here, just free-form blowing and lots of cacophony, yet somehow it all works. Think of Zappa's big-band era in the early 70's mixed with the Soft Machine and you get a good sense of what is in store here. Keith Tippett put together this 50 piece orchestra with personnel from Soft Machine, King Crimson, Nucleus, as well as many other notable jazz and rock musicians. The music goes from manic, disjointed bursts of eclectic mayhem, to more quite, atmospheric moments. Fans of frenzied woodwinds and horns will love the many squeals of saxes, trumpets, trombones, oboes, flugelhorns, and clarinets. While there are also keyboards and guitars, this project is more about the aforementioned instruments, with a rock solid bass and drum section. Vocals are sung sparingly, and at times you barely will even notice them. Part Two might be the best section, with a somber opening colored with numerous sax and flugelhorn lines before the guitar and full orchestra comes chrashing in for some hard edged stomping. Septober Energy is not for everyone, as at times it is a bit jarring, but for avant-garde jazz lovers and those into experimental progressive rock with a fusion edge, this will be a real treat.